Most San Diego vacationers forego visiting the Birch Aquarium at Scripps in favor of the more glitzy SeaWorld but there are many reasons to visit this smaller sea life attraction. 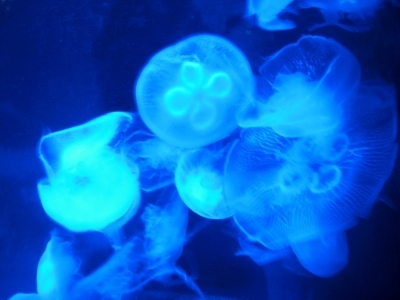 The aquarium offers a wonderfully low-key alternative to its famous competitor. If you have cash to spare and you want to see killer whales and dolphins performing splashy tricks, then go to SeaWorld. If you are on a tight budget and you want an educational hands-on experience, choose Birch Aquarium. 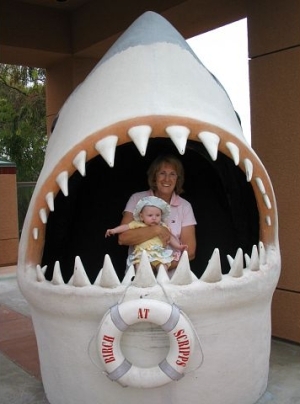 Parents traveling with babies or toddlers will find that young ones have little interest in SeaWorld shows and prefer seeing fishies up-close at Birch, too. Plus, admission prices are significantly lower and parking is free. 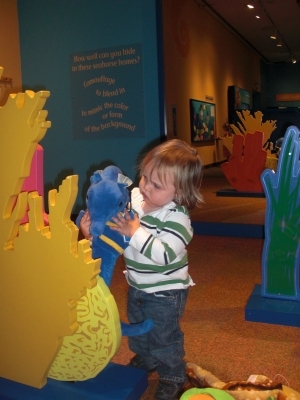 Also, the aquarium’s interactive exhibits encourage visitors to think, rather than just be entertained. Read on to learn why to visit San Diego’s Birch Aquarium during your family vacation. 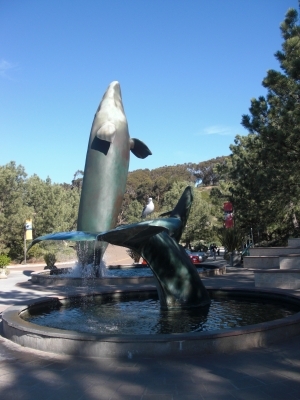 The impressive “Legacy” Whale Sculpture Fountains greet visitors to the aquarium. Kids love dipping their hands in the water and then chasing each other around the giant whale statues just outside the aquarium’s entrance. Wander through the Hall of Fishes and peer at amazing creatures like jelly fish, eels, and colorful fish from around the world. The octopus exhibit is my favorite. When my daughter was a baby and I held her up to the glass to view the eight-legged creature, the normally fuchsia-colored octopus shrunk itself into a small white ball before violently throwing itself against the exhibit’s glass. From reading the exhibit’s information, I learned the octopus will change colors before attacking prey or when agitated. Apparently my infant looked like a yummy (or threatening) snack. Of course, no one was hurt but it sure was interesting to witness. Another crowd pleaser is the large Kelp Forest Tank, which spans an entire wall and is filled with leopard sharks and other fish, huge and small. This is a nice place for parents to rest a bit while the kids gaze at the giant display of fish or climb up and down the carpeted bench seats. In the outdoor Tide Pool Plaza, kids can pet animals like sea slimy cucumbers and scratchy sea stars. Staff and volunteers are pleased to share their knowledge of the sea life with you. The sweeping view of the Pacific Ocean in the distance isn’t bad either. 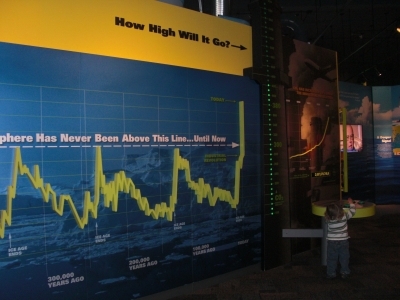 This exhibit uses interactive videos, games, and displays to teach how the actions of human beings impact nature’s delicate balance. Parents and kids can learn useful tips for what we can all do to have a positive impact on our oceans’ future. View beautiful seahorses and seadragons in this mesmerizing exhibit. The nearby Camouflage Corral teaches children how these unique animals and others use to camouflage themselves. The Smargon Courtyard is an outdoor area where you can ham it up in a giant model of a shark’s mouth, view tropical shark tanks in the Shark Reef, and learn about water through play. I always have a hard time pulling my children away from the Wonders of Water display, where kids build dams, create rapids, and race plastic boats in tables of moving water. Visitors will find an array of ocean-themed toys, books, wind-chimes, and other goodies in the Book & Gift Shop at Birch Aquarium. Proceeds benefit this non-profit organization. For an inexpensive souvenir of your visit, imprint a penny with a shark, whale, or fish design in the machines just outside the store. Photo booths also make a fun way to remember your visit to Birch Aquarium. 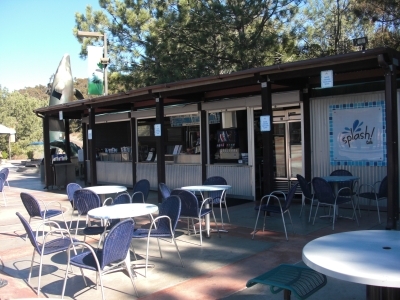 Birch Aquarium’s outdoor café offers sandwiches and salads. The food is fine but my advice is to bring a sack lunch or plan to eat elsewhere before or after your visit. Whereas at some sites, the food is part of the experience, here the marine life and exhibits are the stars. I have nothing against SeaWorld San Diego. I have visited the amusement park numerous times with my family. But as a San Diego resident, I renew my membership year after year to the Birch Aquarium at Scripps. The cost of membership is reasonable and comes with a pack of passes and discount coupons for friends and visitors. Plus, I feel good knowing my money is going towards saving our oceans. The beauty of a visit to the Birch Aquarium is its simplicity. The focus is on education and conservation, not big shows and rides. Its small size and low cost make it an easy activity to tackle with children. And, kids just love getting up-close to learn about fish and other sea creatures! 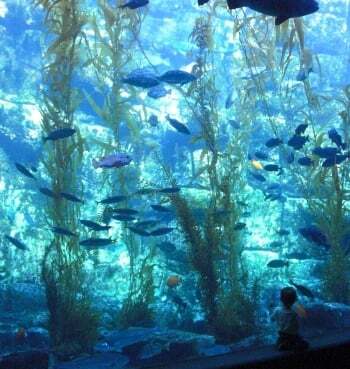 Read more about Birch Aquarium at Scripps on TripAdvisor.com. Which are you more interested in visiting, Birch Aquarium at Scripps or SeaWorld San Diego? Let us know in the comments below! A Note from The Travel Mama: This story includes affiliate links. Your clicks and purchases help to keep TravelMamas.com a free resource for readers like you. Yet another reason why we need to go back to San Diego. 🙂 There are just too many fun things to do there for one visit. I missed out on this aquarium but it looks like it will be a fun outing. Great report, Colleen! Now I wanna go there! Thanks for you kind comments, Amy & Lisa! I’d be happy to take either of you to Birch Aquarium next time you are in San Diego! This is definitely on my list next time I go to San Diego! Birch Aquarium! So wonderful they are not in it for selfish reasons and help protect our oceans. My parents took me to Seaworld several times as a child and I just remember the last time, I was maybe 7 or 8. There was a small very crowded tank of dolphins packed like sardines in a can with people just staring down at them making little comments and jokes. The dolphins were obviously anxious and thrashing about in that tank. I had the strong feeling they were angry at the people and only now I can realize why. Seaworld is a disgusting place that will end when more people learn the truth of what it is. There are other ways to amuse your children then by taking them to look at miserable animals sentenced to life without freedom. Amber – Thank you for your comment. I like SeaWorld as well as Birch Aquarium, but I understand your viewpoint. Similar to Birch Aquarium, SeaWorld makes many efforts to protect the world’s oceans. We are in San Diego for the first time! Besides many days planned for beach time and “lazy” time spent at “home” we are planning to visit Legoland (boys are 7 and 5), the zoo and the Birch Aquraium. We have a Sea Life Aquarium near us in Phoenix, and Sea World isn’t so interesting these days. Plus my hubby exuded enthusiasm hearing it is part of SC San Diego. Yay for education and conservation!! Glad you are enjoying San Diego and the wonderful Birch Aquarium!